Water purification method by which water passes through a semipermeable membrane, from a solution of higher solute concentration to one of lower solute concentration (the reverse of natural osmosis). Reverse osmosis removes molecules, ions, and larger particles from water. Such systems can purify large amounts of drinking water. The technique also removes bacteria and viruses. Unfortunately, it also removes nutrient minerals. Most systems use three times the amount of water they treat. 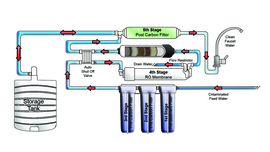 The average cost to install a reverse osmosis water purification system is $150 to $300.